airberlin is offering fares from $599 including all taxes and surcharges to many destinations throughout Europe until and including November 14, 2016. Business class tickets are available from $2299 including all taxes and fees during the special offer. Flights are available for example from Miami to Copenhagen to experience the Danish capital or from Chicago to Krakow and Warsaw to enjoy Polish traditions and history. Many other routes are included such as Los Angeles to Florence and New York (JFK) to Budapest. Included in the transatlantic service is free baggage allowance which includes one item of baggage weighing up to 23 kg, in economy class or two bags weighing up to 32 kg in business class. In-flight service includes meals, beverage service throughout the flight and complimentary amenity kits for overnight flights. Fares offered are valid for travel from January 11 through June 30, 2017 and in business class from December 1, 2016 through March 31, 2017. Fares vary depending on departure city and final destination. Certain rules and restrictions apply. 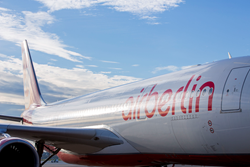 Tickets can be booked at https://www.airberlin.com, through the service center at 1(917) 261-3165 (local rate) or through a travel agent.